Rev. Samuel D. Lougheed was a chaplain in the Union Army during the U.S. Civil War, serving with the 8th Missouri Infantry during the Vicksburg campaign, in which then-Major General Ulysses S. Grant successfully split the Confederacy in half. Before and after the war, Lougheed presided over a small Methodist congregation in Beaver Creek, Illinois, reaching out to his community along with his wife, Jennie. Samuel and Jennie wrote frequently to each other during the war, though not as often as Samuel would have liked. He would despair whenever his wife’s letters failed to reach him, and he assumed that she had forsaken him. In a few of his own letters, he would call her “cruel” and “heartless” for neglecting him—and then immediately apologize when he received her next letter. He often forgot about the unreliability of the wartime mail system. 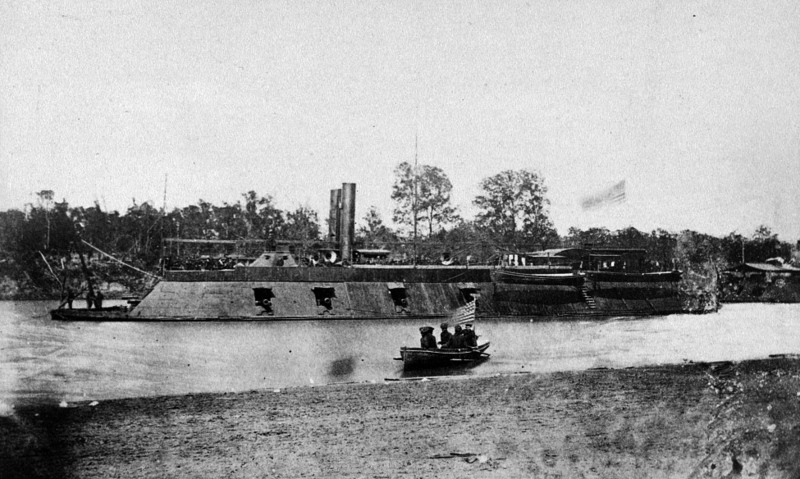 U.S. gunboat patrolling the Mississippi River. Lougheed's unit relied on waterways for some of their later travel. A year of service killed any romantic sentiment Lougheed could have had about the war. While he remained committed to the Union’s cause, he despaired to think that God could bless his regiment, which he felt represented the worst of humanity. The officers opposed his attempts to hold services, and the foot soldiers looted or stole from the towns they passed. Nine men in the regiment even assaulted a young civilian woman. I know God is able to make the wrath and wickedness of men serve Him, and my prayer is that He will do it. But, my dear, I am now fully converted to the belief that if we are dealt with as we deserve we must suffer defeat, and our enemies triumph over the nation, and the last hopes of humanity in relation to republican institutions must be forever entombed. But O Lord, have mercy upon our wicked, our Christ-less army. And for the sake of the few who do fear Thee, give success to our arms, and hasten the time when the nation shall learn war no more. Little sustained Lougheed except for his time with the Scriptures—and the grace he saw in his wife’s letters. For one week or more I have felt sad and sick. Sad, because I could not hear from you—day after day passed, and nothing, no nothing could I hear. Well, my sadness broke away today like the storm cloud in a summer sky when God throws the rainbow over it. Just so with your letter. Had it been your own sweet self, whispering words of gentleness and kindness upon my spirit, the dispelling of the cloud of gloom which hung over my mind, could not have been more apparent. Samuel cherished Jennie’s letters, reading them over and over again by candlelight, longing for the day he could return to his family. My home is to me the brightest, happiest spot on Earth. It is there my own dear Jennie is the presiding angel. There too are my own sweet children, of whom, with thee Love, ever, I'm fondly thinking no matter where I may roam. Tis near thee, and my dear children, I desire to live. And whenever, or wherever, it is my lot to die, I ask with my last gasp to lisp the precious names of Jesus, Jennie, and my children, and there let me repose in silence, till we all meet again, Love, ne'er to sever, on the other side of Jordan in the sweet fields of Eden, where the tree of life is blooming. Sweet hope, sweet prospect, sweet Heaven. Then, Love, life's voyage will be over. Life's cares, anxieties, and toils will all be ended. Our hopes and fears will too forever cease; for we then will realize the full fruition of the things hoped for during our state of probation. The things we saw so faintly through faith's dim eye, on Earth, we will then behold with unobstructed vision.
. . . I expect I shall the blessed Jesus, I shall look for the prints of the nails in His precious hands and feet, I shall look for the side opened by the soldier’s spear, I shall look also for the scars made in His sacred temples during the terrible battle of Calvary, where the Captain of our salvation was wounded, and pierced many times, but was ultimately the Victor, and triumphed over every foe. I shall want to kiss His hallowed feet, and shout His praises as loudly as the angels will let me, and as long as the endless ages last. 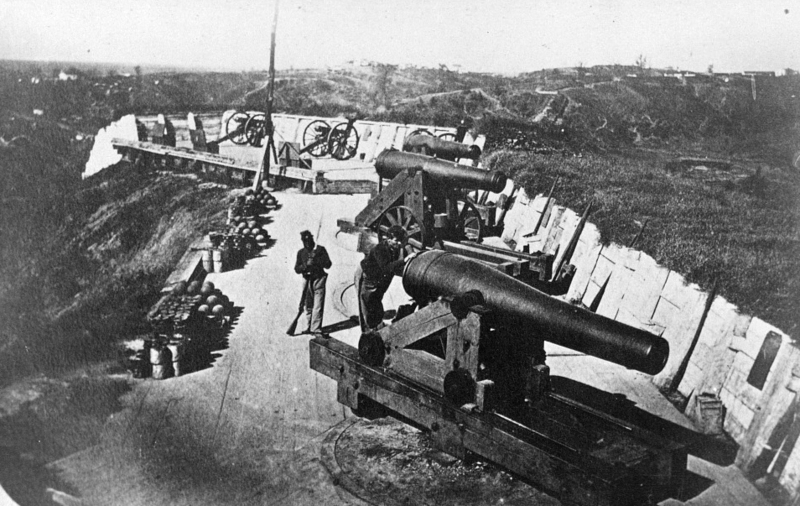 A battery constructed by Sherman's army to defend Vicksburg after its capture by Union forces. After the fall of Vicksburg, Lougheed returned to his wife and children in Illinois. In his absence, Jennie had continued Samuel’s ministry and maintained the family farm, but they would soon move west to Kansas and then Washington, where Samuel died in 1893 at the age of 68. In Lougheed’s letters we find the heights of hope and the depths of despair—places we can all reach as we walk the path God gives us. But like this discouraged chaplain, we should look in hope to the words written by the One who loves us most. From God’s Word flows the love and grace we need during our long journey through this hard and often disheartening world. Around us we see wickedness and despair, with even good causes falling ruin to corrupt people. But in God we see perfect truth—truth worth fighting toward, truth we can cling to in faith until we see God’s face with our own eyes. And as we learn now to view the world from His perspective, we’ll see more and more of His work in the hearts of those around us. *Excerpts taken from the Samuel P. Lougheed Letters, University of Washington Special Collections. Images from archives.gov and loc.gov.